Day 2: April 28, 2015. 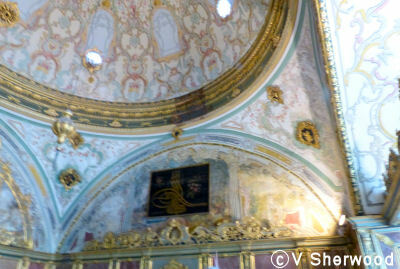 Our first excusion was a tour of Topkapi Palace and the Hagia Sophia. We took a bus from our hotel to the palace. Our guide was very knowledgeable and we learned the history and many interesting facts and stories about Topkapi and Hagia Sophia. 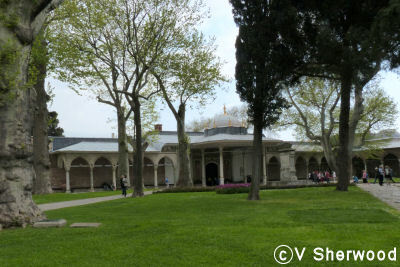 Topkapi Palace was the residence of the Ottoman Sultans for almost 400 years (1465 to 1856). 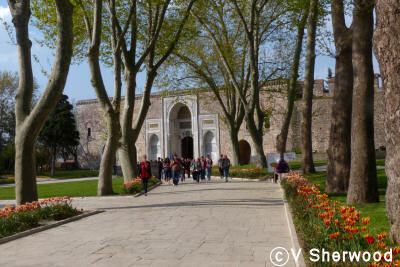 Topkapi means Cannon Gate. The palace has four main courts plus other smaller buildings. As well as palace, it included a Byzantine church (Hagia Eirene), a mosque, a mint, a hospital, kitchens and a bakery and housed over 4000 people. It was royal residence, audience chambers for foreign dignitaries, and venue for royal festivals. Now it is a museum and UNESCO World Heritage Site. 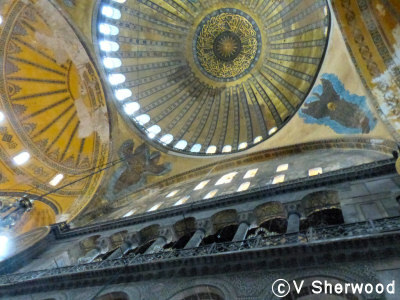 Hagia Sophia (Holy Wisdom) has quite a history. It was build by the Roman Emperor Justinian in 532-537AD as a Christian (later Greek Orthodox) church. It was the largest cathedral in the world until 1520. 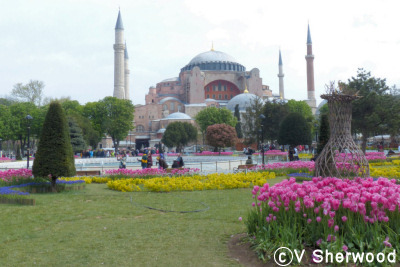 It became a Moslem mosque in 1453 when the Ottomans conquored Constantinople. It was desecularized in 1931 and made into a museum so that it could be visited and admired by all faiths. 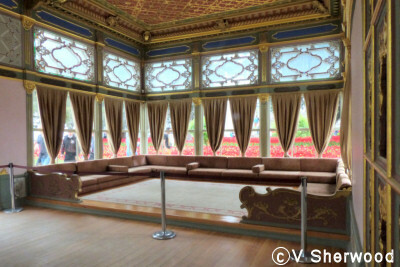 This is a model of Topkapi Palace. 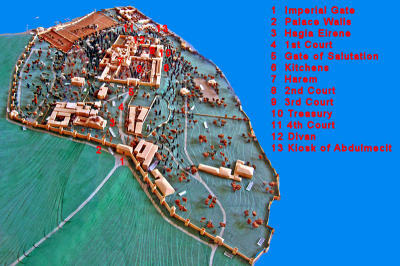 It is build on the site of the Greek and Roman Acropolis, overlooking the Golden Horn (top left) and the Sea of Marmora (right). Construction began in 1459. 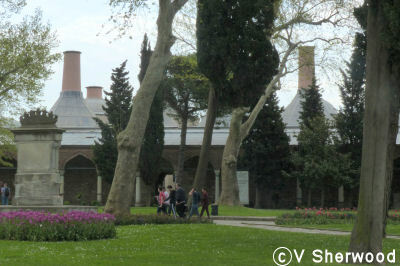 For almost 400 years, Topkapi was the main residence of the Ottoman sultans. The main palace is divided into 4 courts. 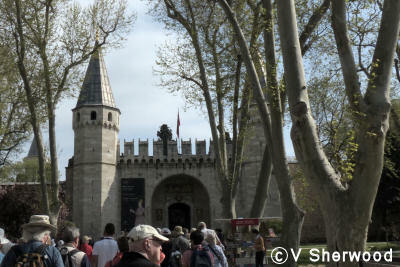 The Imperial Gate is the entrance into the First Court of Topkapi Palace. 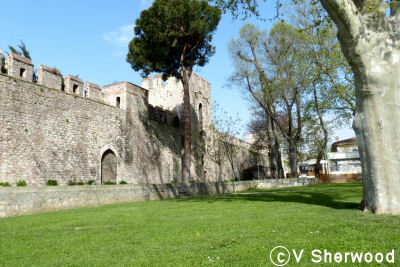 The palace and grounds are surrounded by high walls. As well as the residence of the sultan and his family, audience chambers,and treasuries, there is a Byzantine church (Hagia Eirene), a mosque, a mint, a hospital, kitchens, a bakery and serveral kiosks. At its peak it housed over 4000 people. Within the First Court is the Byzantine Church Hagia Eirene. It was not destroyed by the Ottomans but was used as a storage and arnoury. 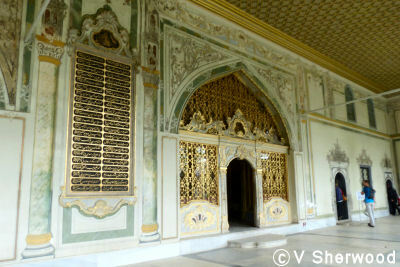 The Gate of Salutation leading into the Second Court.. The kitchens and bakery in the corner of the Second Court. They now house collections of cookware, porcellan and silverware. The doorway to the Audience Chamber in the Third Court. The ceiling of the Audience Chamber. The Harem housed the Sultan and his family as well as his "favourites". It had entrances from the Second and Third Courts. A divan off the Fourth Court. The back of the Treasury and a small mosque in the Fourth Court. The Treasury houses gifts from foreign dignitaries to the Sultan and other valuables. You can see the famous emerald daggar stolen in the film "Topkapi" there. Entry is from the Third Court. 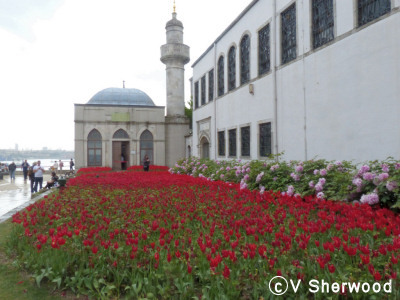 Throughout the palace there were gorgeous gardens ablaze with tulips and other spring flowers. Tulips originated in Greece and Turkey and still grow wild there but these domesticated tulips came from the Netherlands. The Kiosk of Abdulmaçit. The building now houses a cafe. From the terrace there are panoramic views of the Bosphorus and Sea of Marmora. Unfortunately it was drizzling, the only rain we had on the whole trip. 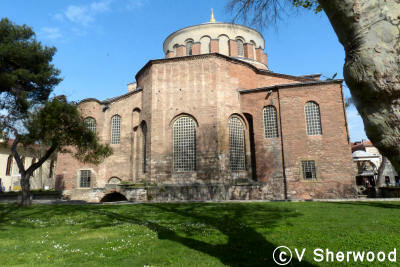 However, it did not last long and we walked to the Hagia Sophia in sunshine. 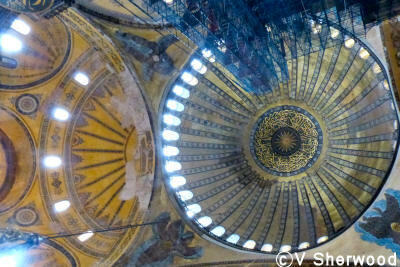 This is the third Hagia Sophia to be built on the site. The first two were burnt in riots against Empress Aelia Eudoxia in 404 and the Nika Riots in 532 AD. This Hagia Sophia was built by the Byzantine Emperor Justinian in 532 to 537AD and was the largest catherdral in the world for almost 1000 years. Ionian columns from the Temple of Artemis in Ephesus and Corinthian columns from Baalbek were used in the building. 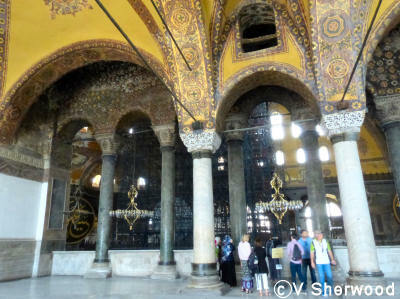 The 4 minarets were added when the Greek Orthodox cathedral became a mosque in 1453. 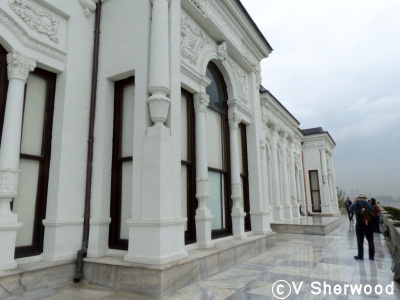 In 1934, it was made into a museum by Mustafa Kemal Ataturk, the first president of Turkey. 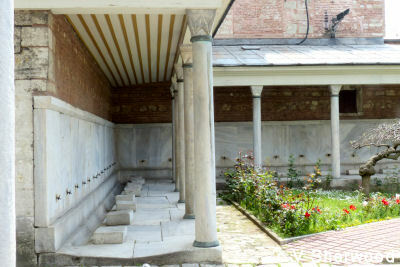 While Hagia Sophia was a mosque, this is where moslems washed their feet before entering the building. You have to take off your shoes before entering a mosque. 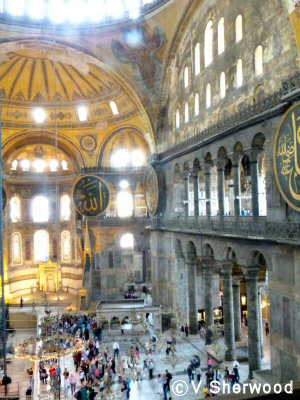 Hagia Sophia is really immense. This is looking towards the altar end of the building. The dome is huge, about 31 metres in diameter. There is scaffolding at the top right of the photo as restoration work was in progress. The central dome sits on 4 huge arches. There are half domes at each end of the nave. On the sides, huge columns and arches support the dome. Massive columns are arches support the dome. The arches are beautifully decorated. In Eastern buildings, always look up: the ceilings are often much more beautiful than the walls. 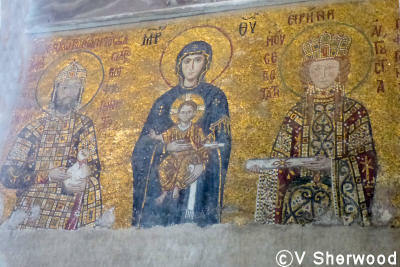 A Greek Orthodox mosaic of Mary and the Baby Jesus. It was plastered over while the building was a mosque. 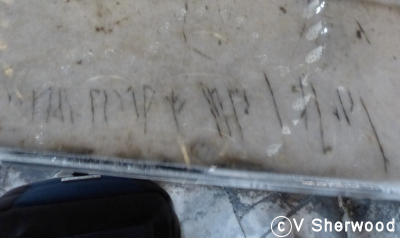 These are Viking runes carved in the marble railing of the second-floor balcony. Vikings were employed as royal guards of the Sultan.